The transparent Berkey Light water filter system is designed for use either at home or on the road. 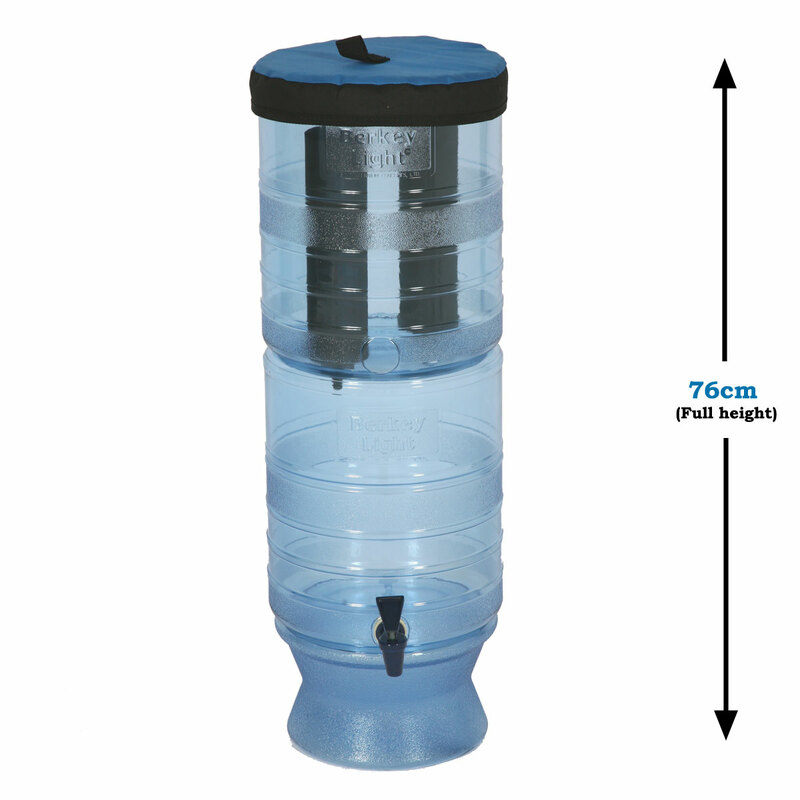 Easy to set up and quick to dismantle the Berkey Light is the ideal camping water filter system whether at a campground in Wales, a secluded beach in Cornwall or in a caravan touring the Lake District. Also during unexpected emergencies whether in a cottage out in the English countryside or in the middle of London the Berkey Light assures you of clean filtered water. The Berkey Light water filter system may be ordered with your choice of one discounted Berkey accessory. For a description of the various Berkey accessories see: PF-2 Fluoride/Arsenic Filters, Berkey Replacement Parts or Berkey Primer. The Berkey Light water filter will purify your home’s treated tap water as well as untreated water from such sources as lakes, brooks, ponds and water sources in foreign countries, where the local water supply may be compromised or regulations may not be adhered to. 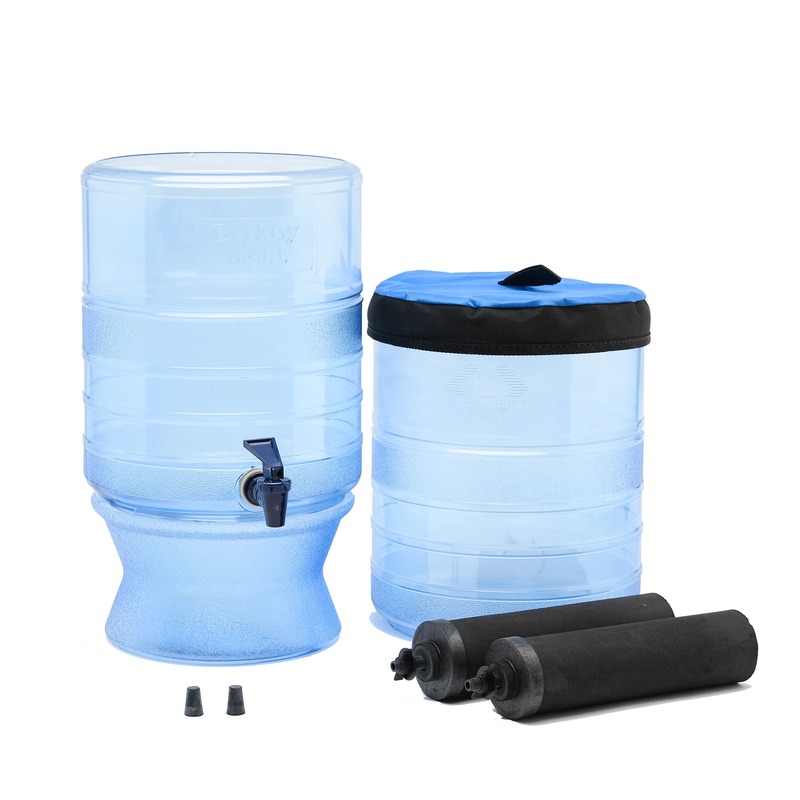 The Berkey Light is the ideal water filter for all outside activities and is definitely a must in inhospitable environments where electricity or clean drinking water may not be at hand. The Berkey Light assembles in minutes without tools, electricity, water pressure, or plumbing. The Berkey Light is also easy to operate, clean, and maintain. The Berkey Light water filter system eliminates pathogenic bacteria, cysts and parasites entirely as well as removing toxic chemicals such as herbicides, pesticides, pharmaceuticals and all manner of VOCs, organic solvents and trihalomethanes. In independent testing the Black Berkey filters have also been found to reduce nitrites and toxic minerals among others: lead, mercury and aluminum (See a detailed list of which contaminants are eliminated by the Black Berkey Filters). Besides this the Berkey Light water filter leaves undisturbed and intact the beneficial minerals your body requires. The Berkey Light water filter does not leach foul tasting plasticizers into your water and will not retain foul tastes and odors from waterborne contaminants. Manufactured of a shatter resistant, high impact strength non BPA copolyester; the Berkey Light comes standard with two or four Black Berkey water filters and a base. The Berkey Light stands 53cm. when used without the base (included). 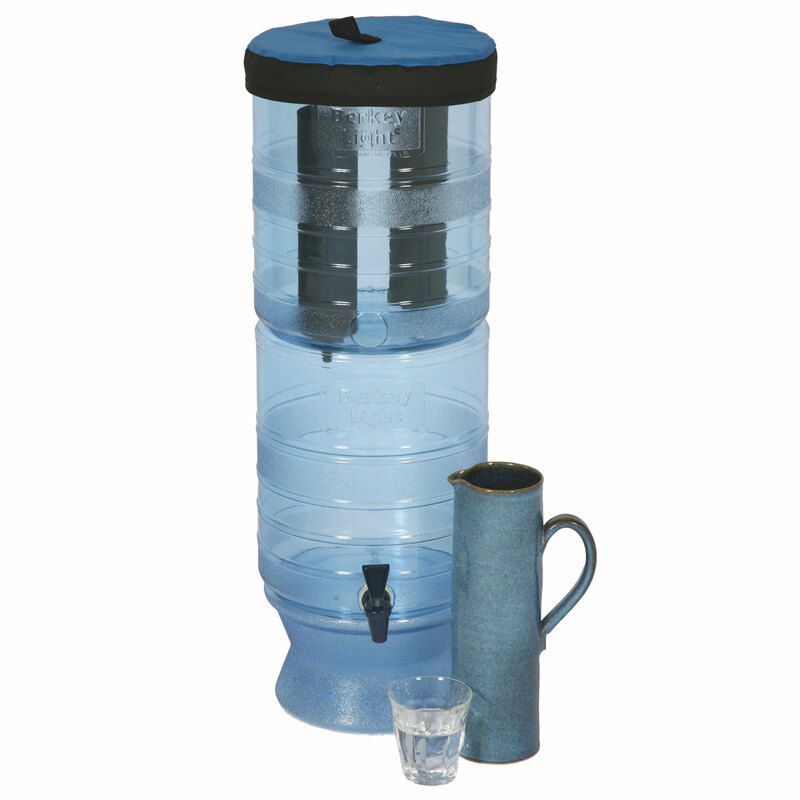 Each durable Black Berkey filter will last for up to 11,350 liters (22,700 liters per set of 2). At 38 liters per week, this is equivalent to 600 weeks. That's more than 11.5 years of clean water! *Flow rates are calculated with upper chamber full to top. The flow rate decreases as the water level declines. As it is impractical to keep the upper chamber completely full at all times, the flow rates are in practice less than the stated optimal rate. Thank you for the Berkey water filter. I just wanted to ask about the filters. There is a small chip on the corner of one of them. Will this affect the function? No this won't effect the functioning or the lifespan of the filter, it's quite common and happens during the production process. The Black Berkey filters are about twice as thick as standard gravity filter elements and have a built in redundancy. If the filters have passed the red food color test then you can be assured that they're working properly. I have a Berkey Light and wish to use it to filter water from a stream. I would like to pre-filter the water to get out any larger particles, little animals etc. if there are any, just to keep the Berkey filters as clean as possible. Do you have any equipment for this or advice on what I should use? Yes, that's a very good idea to pre-filter larger particles etc. I would suggest setting up 2 pails one above the other, drilling small holes in the top one and then partly filling it with clean sand. To prevent sand leaking through the holes you may need to put in a fine wire mesh on the bottom as well. Then fill it with the stream water and then put the sand filtered water through the Berkey. If a bit of sand were to get into the upper chamber of the Berkey that's not a problem as it will sink to the bottom anyways. Alternatively you could also pre-filter with a piece of cheesecloth, although I would recommend the sand method. I’m thinking about buying a Berkey Light Water Filter since I have very hard water where I live. Will this filter help remove the minerals and soften the water?